Though I said in my last post that my half marathon dreams were over for the summer, I spoke too soon. The trip is postponed and I’ll be running in August after all! That being said, I had to jump back on my training schedule immediately (easy thanks to my meticulous Google Calendar planning). I find when getting back on track after a slip-up, it’s best just to pick up and continue training on schedule rather than start completely from scratch. Having finally reached my weight loss goal (yeah! ), and working on my running speed, have definitely been helping a lot. But if I want to smash last year’s personal record (2:24) I have to train strategically, especially in areas I fell short in last year, such as the hills. I think I only ran one 8-miler last year in preparation for the Rock N Roll Half! How did I even survive?! So this year I’m doing it right, and doing a little experiential research to boot. The last two Sundays I completed my first real long runs outside – 9 miles outside & 10 miles on a treadmill. For the outside run, I took a portion of the path I usually ride my bike to work on because it’s fairly flat and set away from traffic. It was pretty hot and humid, and since I forgot sunscreen, I felt as if I was running away from sunburn as the afternoon sun set at my back. I made it all the way to Seaport Village as the halfway point, and stopped to re-tie my shoes and fill my water up a bit, but no more. ‘Scuse the sun-blasted red face; Found the kissing sailor statue on my way back around the harbor; I had no idea where in town it actually was and I’ve lived here for six years! The run back to the car was exhausting but I really found my groove, and was impressed when my iPod reported I was under 9-minute pace for the entire run. During the Rock N Roll last year, I ran just under 11-minute miles on average, so that’s a HUGE improvement on my endurance shining through. I could even pull a sub-2 hour half marathon in a few weeks, which would be a dream come true. As for the 10-mile treadmill run last week, it was much slower and tougher than I thought it would be, and I didn’t get nearly the level of satisfaction as I did from completing the run outside on the harbor. Unfortunately I’m skipping this weekend’s 12-miler due to some ankle and knee pain I’d like to go away, but next weekend I have a hill in my neighborhood I want to attack. Then it’s almost taper time! PRO – When training for a race, it’s essential to get practice in a realistic environment. On the hard surface of the street or sidewalk, you’ll be facing a lot more impact during a real half marathon than just the cushiony surface of the treadmill. You may also face hot or cold weather, or wind and sunburn, so practicing outside can really help prepare you for how the race will actually feel. CON – Unfortunately, there’s no cup holder on the open road. One of the things I love best about the treadmill is having my hands free of distractions – water bottle, keys, towel, etc. For running outside, it’s really important to invest in a zippered running belt for your essentials. This will help you bring snacks, phone and keys along for an emergency, and you can even buy a hydration belt that comes with little water bottles on the hips. PRO – The more mileage you put down, the more important it becomes to have correct running form. You may not realize how much the treadmill is “helping” you along, but your legs end up anticipating the motion of the belt and your stride is impacted negatively. If you can learn to keep your form straight on the pavement mile after mile, you can certainly keep it tight during a race. CON – The first few times I ran more than a 5K outdoors, I definitely had my moments of panic. Being so far from home, on foot, without snacks or water (GET A BELT! ), and starting to get tired, one often wonders if they will even make it without passing out or having an asthma attack – valid concerns. 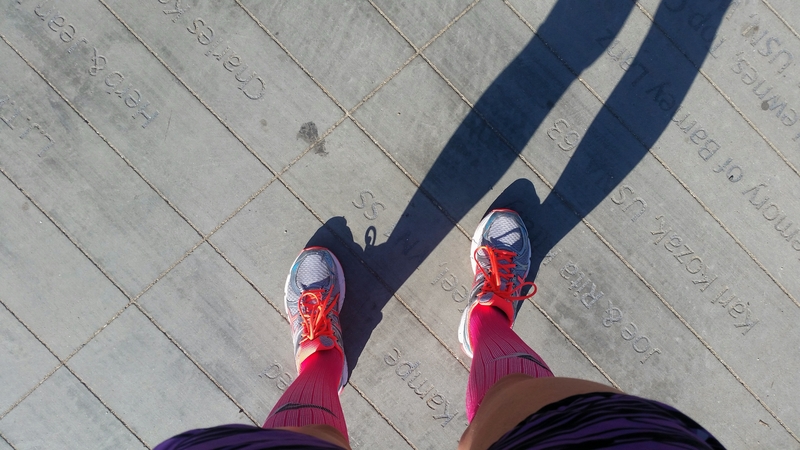 Know your body and your endurance level before embarking on an outdoor journey, and invest in proper shoes and gear (compression socks or KT Tape) to decrease chance of injury from all the impact of the pavement. What do you think? Are you making strength & speed gains on the treadmill, or do you shake it up with some rough pavement runs every once in awhile? I can’t stand the treadmill! I’ll hop on for a speed workout or hills if it’s really absolutely terrible outside but that’s about it. There is so much to look at out on the roads! I love putting my feet to the pavement. Walking is great cardio. I walk and run. congrats on the training; nice job! Thank you! Hoping to kill it this time around! You are so right. Running on a treadmill is so different than running on pavement. Seems odd. Glad your training is going so well. Good luck! Previous Previous post: Checking in + HEMP HEARTS Winner! Next Next post: “Synthetic Marijuana” – DO NOT SMOKE under any circumstances!